Figure 17.6. Model for translational control of yeast GCN4 synthesis. GCN4 mRNA is shown with ORFs 1 and 4 (boxed). 40S ribosomal subunits are shaded when they are associated with the ternary Met-tRNAi:eIF2:GTP complex and thus competent to reinitiate translation; unshaded 40S subunits lack the ternary complex and therefore cannot reinitiate. A: Under non-starvation conditions, eIF2:GDP is readily recycled to eIF2:GTP by eIF2B, leading to high levels of eIF2:GTP and ternary complex formation. The ternary complexes thus formed reassemble with 40S particles scanning downstream from ORF1, causing reinitiation to occur at ORF4. B: Under starvation conditions, uncharged tRNA accumulates and activates the protein kinase GCN2 that phosphorylates eIF2a. The phosphorylated eIF2 traps a significant portion of eIF2B and thus reduces the rate of eIF2:GDP-to-eIF2:GTP recycling, resulting in a low level of ternary complex formation. In this situation the 40S ribosomal particles scanning from ORF1 have low chance to reassemble with the ternary complex while scanning from ORF1 to ORF4, and most of them do not reinitiate at ORF4. While scanning further they have time to catch the ternary complex and so reinitiate at the start of the coding sequence of GCN4 mRNA. (Reproduced, with some modifications, from A.G. Hinnebusch, in "Translational Control", J.W.B. Hershey, M.B. Mathews & N. Sonenberg, eds., p.p. 199-244, CSHL Press, 1996, with permission). most of the scanning particles will bind the ternary complex while traversing the leader segment between the fourth ORF and the start of the GCN4 coding sequence. Cauliflower mosaic virus (CaMV) 35S RNA has a long 600 nucleotide leader containing seven short ORFs (Fig. 17.7 and ref. in it). Translation of the downstream viral polycistronic message requires the recognition of the capped 5'-end and the subsequent scanning of the leader by the ribosomal initiation complex. As expected, the ORFs within the leader are inhibitory for the initiation of translation of the main viral cistrons. In addition, according to the secondary structure prediction, almost all the leader sequence is folded into a long compound hairpin (as shown in Fig. 17.7 where paired nucleotides are connected by arcs) that should be a high-energy barrier on the way of the scanning complex. All this makes the CaMV RNA hardly translatable both in vitro and in vivo in the systems from plants not hosts for the virus. Figure 17.7. Schematic representation of secondary structure, short ORF arrangement and migration of scanning ribosomal particles along the leader sequence of the cauliflower mosaic virus (CaMV) RNA. A: Predicted secondary of the CaMV RNA leader: paired bases are connected by arcs. B: Positions of seven short ORFs along the leader. 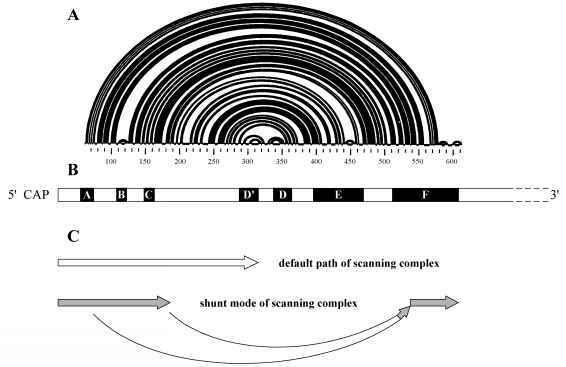 C: The routes of the scanning ribosomal complex: default path (upper) and shunting (below). (Reproduced from J. Fuetterer, Z. Kiss-Laszlo & T. Hohn, Cell 73, 789-802, 1993, with permission). However, an alleviation of the translational inhibition is observed in host plant cells. It seems that the alleviation is provided by the presence (or higher concentration) of a special cellular factor in the cytoplasm, but in any case it has been found to depend on the first short ORFs. It has been demonstrated that when the CaMV RNA is translationally active the initiating ribosomal particle does not scan all the leader sequence continuously but skips the central part of it by jumping it over, or shunting. For this the reading of the first three ORFs (A, B and C in Fig. 17.7) seems to be necessary. It is likely that the translation of these ORFs causes unwinding of the compound hairpin base and thus entering of the ribosomal particle into the structured region. Something exists in the structure that induces the jump of the ribosomal initiating particle (seemingly 43S particle) from a region downstream of the third ORF to a region inside the seventh ORF (F in Fig. 17.7). Then the non-translating (scanning) particle moves downstream and initiates translation at the first initiation codon of the main coding sequence of the RNA. Like in the case of Prokaryotes, translational repression is defined as the prevention of initiation of translation due to the interaction of a special protein, repressor, with a unique structural element in mRNA upstream or at the beginning of the coding sequence. Indeed, stable binding of a protein to the 5'-untranslated region (5'-UTR) of mRNA would block either the association of the ribosomal initiation complex with the cap-adjacent mRNA sequence (or the internal initiation site), or the movement of the ribosomal initiation complex along mRNA towards the initiation site (Fig. 17.8). In fact, this classical initiation repression model has been supported by several observations concerning the role of 5'-UTRs in translational repression of eukaryotic mRNAs. A: Repressor protein binds and stabilises a hairpin near the cap structure, thus preventing its unwinding by eIF2A+eIF2B and the landing of the 43S initiation complex. g B:Repressor binds and stabilises a hairpin remote from the cap and located before or at the beginning cap V w—1 ----3' ofthecodingsequence;insucha case the protein prevents the unwinding of the helix by the scanning 48S initiation complex and its movement to initiation codon. The best studied example of the translational control via interaction of a 5'-UTR element with a specific regulatable repressor protein is the case of ferritin mRNA (for reviews, see Hinnebusch & Klausner, 1991; Walden, 1993; Theil, 1987, 1993; Rouault et al., 1996). Here a 98 kDa protein recognises a 28 nucleotide structure ("iron responsive element", or IRE) in the 5'-UTR, in the spatial neighbourhood of the cap (Fig. 17.9). In the absence of iron (Fe3+) the protein (the so-called IRE-binding protein, or IRE-BP) has a strong affinity for IRE and acts as a repressor blocking the initiation of translation of ferritin mRNA. It has been demonstrated that 5' and 3' flanking sequences of IRE which are mutually base-paired form a stem structure ("flanking region", or FL) changeable upon IRE-BP binding; this change seems to be important for the repressor power of IRE-BP. In the presence of iron ions the affinity of the protein for IRE decreases, and this allows the initiation of translation (Fig. 17.10). The product of translation, ferritin, will bind and occlude the excess Fe3+. The repressor, IRE-BP, proved to be identical to aconitase, the enzyme converting citrate into isocitrate and possessing a 4Fe-4S (iron-sulphur) cluster necessary for its activity. It is likely that the affinity of the IRE-BP for the IRE is governed by the change in the iron-sulphur cluster, which is known to be reversibly convertible from active 4Fe-4S form into inactive iron-deficient form in aconitase. Thus, the same protein with intact, iron-saturated 4Fe-4S cluster is aconitase and does not possess the IRE-binding activity, while its iron-deficient form with the disassembled iron-sulphur cluster is IRE-BP. 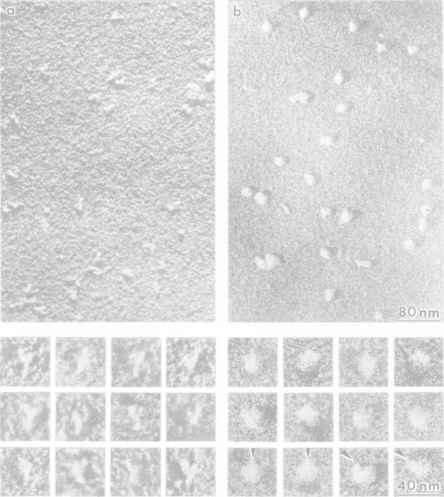 A similar negative regulation system with IRE and IRE-BP has been found in the case of erythroid-specific 8-aminolevulinic acid synthase (eALAS) mRNA. It is remarkable that among different ferritin and eALAS mRNAs the position of the IRE relative to the 5'-terminus of mRNA is evolutionary conserved: the IRE is always located within the first 40 nucleotides of the 5'-UTR. The introduction of a spacer between the cap structure and the IRE results in a reduction or abolishment of the translational repression. In other words, the IRE must be located close enough to the capped 5'-terminus of mRNA in order to block initiation of translation upon interaction with IRE-BP. This observation is in full agreement with the finding that the binding of the IRE-BP by the IRE prevents the association of the ribosomal 43 S initiation complex with the cap-adjacent region of mRNA (Fig. 17.10; see also Fig. 17.8 A).